Fan of The Simpsons? 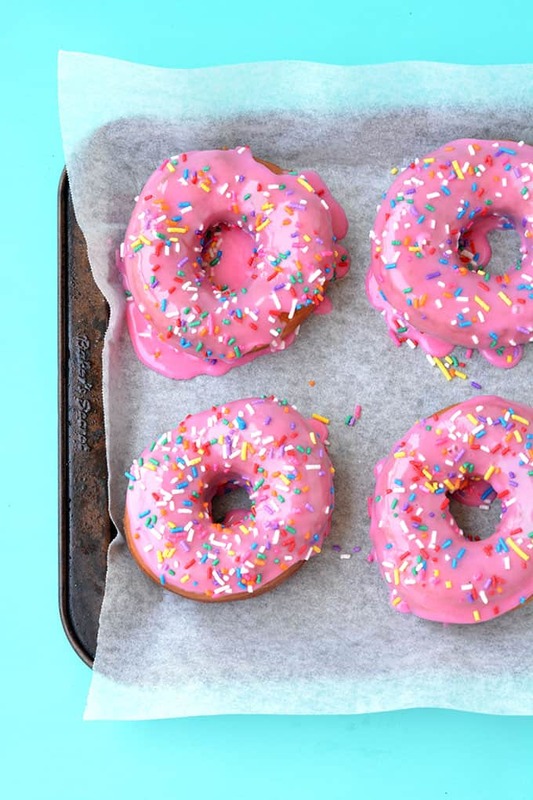 You’ll love munching on these Homer Simpson Donuts. 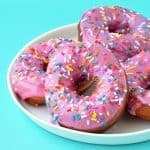 Deep-fried and topped with a sweet pink glaze and loads of funfetti sprinkles, they’re the ultimate donut. 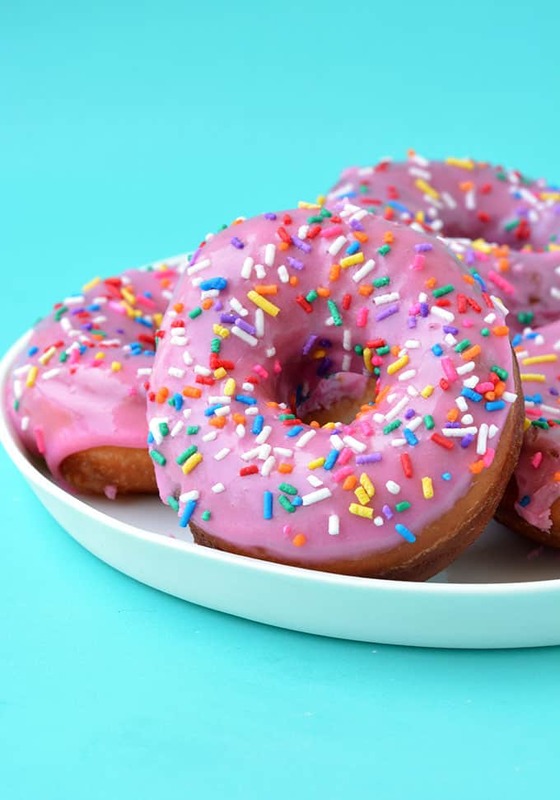 Big, fat, deep-fried donuts, covered in a drippy pink two ingredient glaze and topped with LOADS of funfetti sprinkles. This is the donut of ALL donuts. I actually feel a little naughty writing this post because I was never allowed to watch The Simpsons growing up. In fact, I’ve never watched an episode to this day. I do, however, know who Homer Simpson is, and I know about his serious donut fettish. And I’m more than happy to join him on his donut obsession. 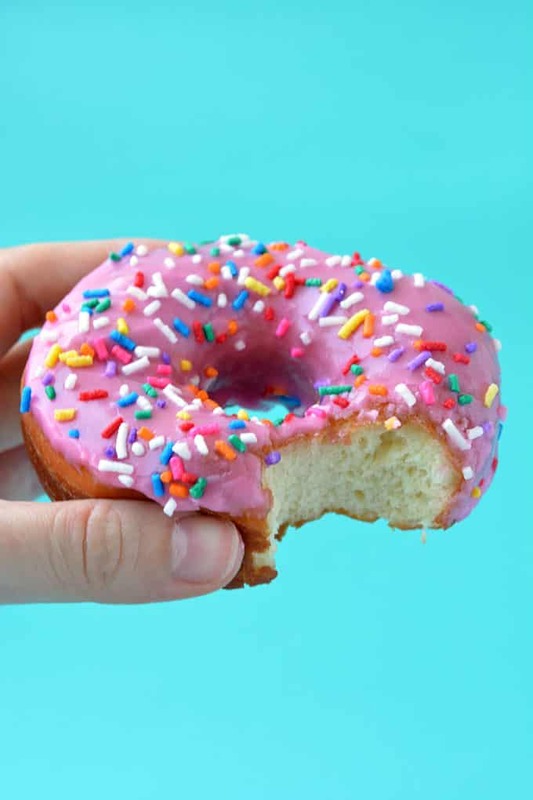 It was just a few weekends ago, that inspiration struck (from who knows where), and I suddenly turned to my husband and said, I should do a Homer Simpson Donut for the blog. So here I am. 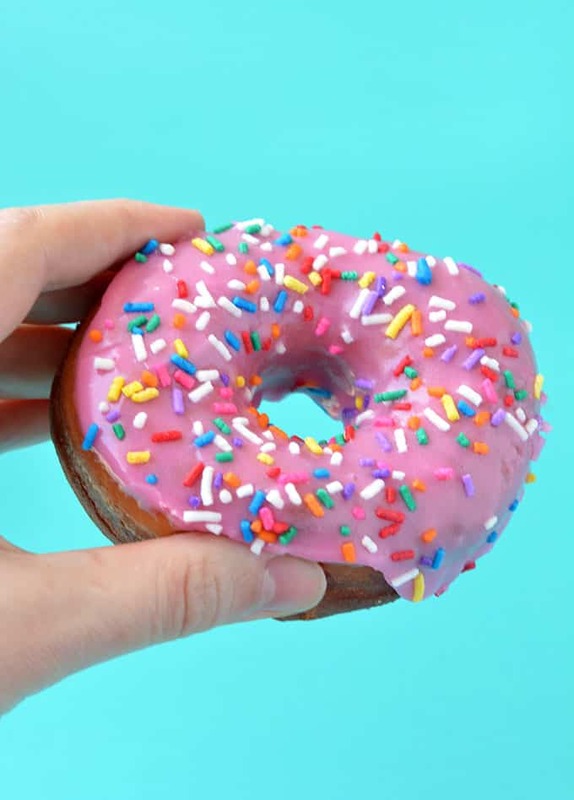 With my version of the Homer Simpson Donut for you to try at home. Whenever I enter a donut shop, usually in the States, I am often paralysed by indecision. So many flavours to choose from, so many pretty donuts to look at, but if there is one with sprinkles, I’ll almost always get it. 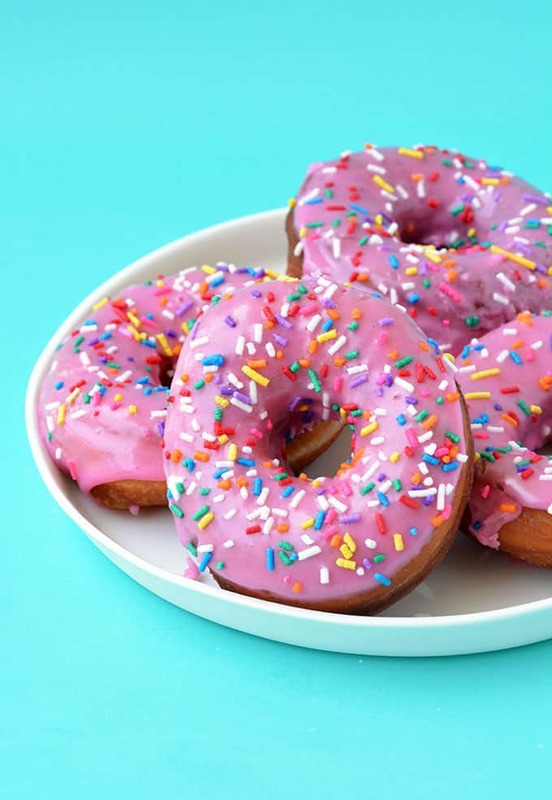 So while I may not technically be a Simpson’s fan, these sprinkle-adorned Homer Simpson Donuts are right up my alley. Do you remember a few months ago when I shared my recipe for Nutella Stuffed Cinnamon Donuts? Still dreaming of those by the way. This is a delicious spin-off using the same donut dough. It produces a light and fluffy donut every. single. time and they’re easier to make than you’d think! Once you take that beautiful, soft dough and cover it in a sweet sugar glaze, you’ll be in donut heaven – I know I was. 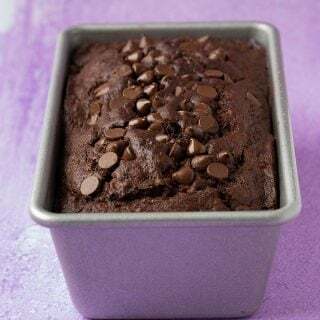 While you know I’m a HUGE fan of no bake desserts, and those with few ingredients, sometimes it’s worth getting out the candy thermometer and going ALL IN. So that being said, who’s ready to deep fry? 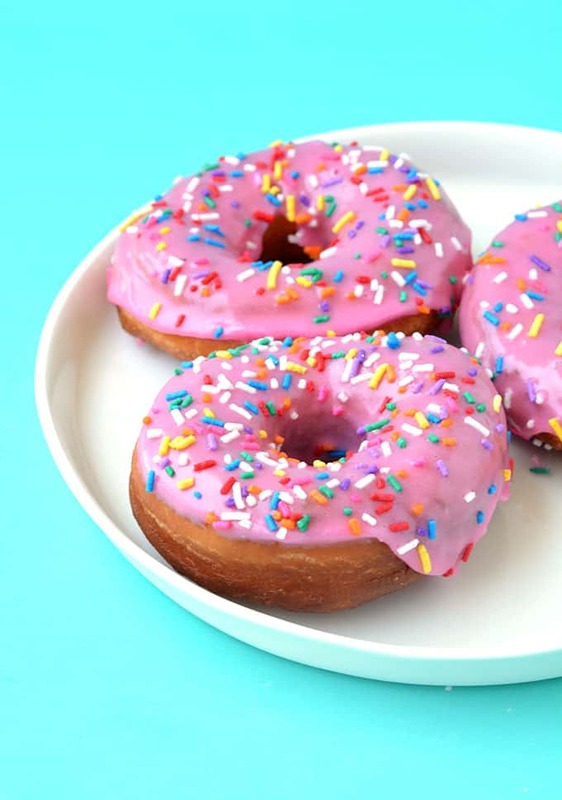 Light and fluffy Homer Simpson Donuts covered in pink sugar glaze. Add 420 grams (3 cups) flour and the sugar in the bowl of your stand mixer. Add butter, egg, vanilla and buttermilk. Add yeast (water and all) and mix with a dough hook for 5 minutes or until dough becomes smooth. If dough is too sticky to the touch, add extra 35 grams (1/4 cup) flour. Line two baking trays with baking paper. Use a donut cutter or large round cookie cutter to cut out circles of dough, approximately 3.5 inch wide. Cut out hole in the middle of each donut and discard. Gently place donuts on baking tray. Cover loosely with plastic wrap. Meanwhile prepare the oil for frying. Fill a large heavy bottomed saucepan with oil and use a thermometer to heat the oil to 180 C (360 F). The amount of oil needed will vary depending on the size of your saucepan. You will want enough oil to come up about halfway of the saucepan, with plenty of room for the donuts to sizzle. 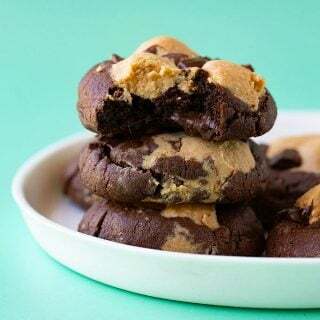 Once they’re golden brown, lift them out gently using a slotted spoon and pop them on a plate lined with paper towel. Leave to cool. Sift icing sugar in a small bowl, add 2 tablespoons of milk and stir until smooth. Add a few drops of food colouring until you reach your desired shade of pink. 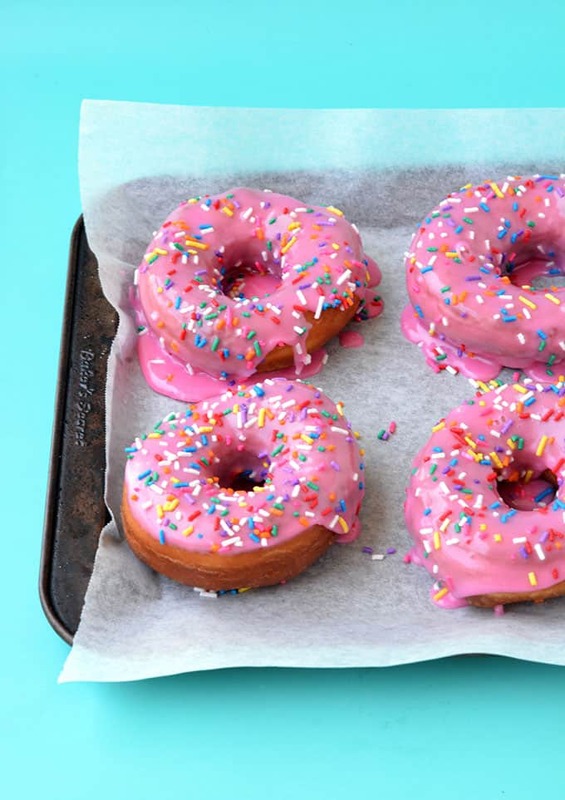 Dip each donut in the frosting, one at a time, and add sprinkles on top. 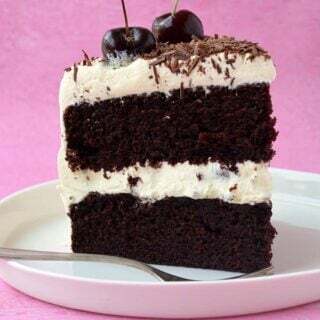 If the frosting gets too thick, add another tablespoon of milk. Sooooo good! These look and sound absolutely delicious!